Inquiry: I am going to perform the BrdU assay on cells which are adhesive but are also quite fragile. With other similar assays I have been having trouble with variability between replicates because cells get easily detached through the process. I was wondering if I could use DAPI as a means to normalise the BrdU signal to the number of cells still present in each well (whether these are dead or alive)? Do you have a suggestions of how this would be acheived? The fixative solution provided with BrdU Cell Proliferation ELISA Kit (ab126556) does an excellent job of keeping the cells in the wells. So it should not be necessary to do anything further to normalize the signal to the number of cells. That being said, it is an interesting idea to do it. If the reader can detect DAPI, it might be possible to test the DAPI with the fixing solution and substrate/stop solutions provided with the kit. The largest unknown would be how the DAPI will react with the addition of the substrate and stop solution. The substrate can be read without the stop solution, if necessary, (at 650 nm) but it will lose sensitivity. So if you have the ability to read the DAPI and the TMB signals, you can can try it. However, this may not work and we cannot guarantee it. 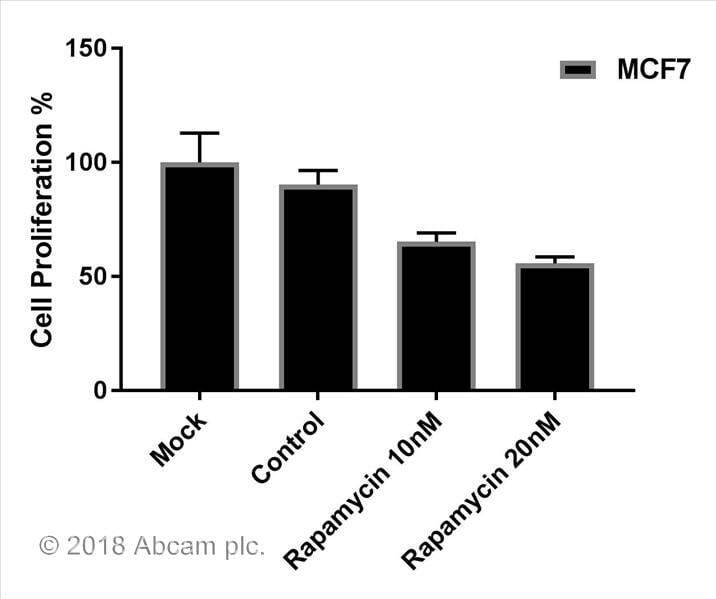 Therefore, if you want to try, we would recommend to build controls into the assay design and also know the number of cells that have been plated. Bad CVs can be dealt with using an increased number of replicates. 1. Is 20ul Brdu, as described in the protocol, added to each well regardless of whether the well contains 100 or 200ul? 2. How are the results to be calculated? 3. 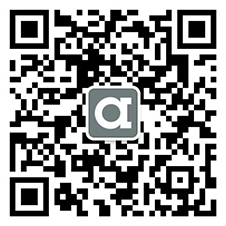 Please explain the data showed on the example data included in the protocol. 4. Why is it suggested to either measure OD450-OD550, OD450-OD595 or OD450 alone when measuring the absorbance in each well? Q1: Is 20ul Brdu, as described in the protocol, added to each well regardless of whether the well contains 100 or 200ul? A1: Yes. The amount of Brdu is in excess, so it is fine to add the same 20ul of Brdu whether or not you have added a test reagent. However if you do add a test reagent please ensure that every well has 200ul medium as a final volume, even if not every well contains a test reagent. This is becuase more medium in a well will provide more nutrients for the cells, causing them to perhaps proliferate faster or to a greater degree, throwing off your data. Q2: How are the results to be calculated? A2: For each experiment, you will have a well treated with Brdu or not treated with Brdu. Just subtract the wells without Brdu from those which were treated with Brdu. -Brdu wells serve as internal control for background. You can run a blank control as mentioned in the protocol as well. However this is just to ensure that there is nothing inherently wrong with the assay. This blank should always have a very low OD such that subtracting it from all wells will have no effect on the data. 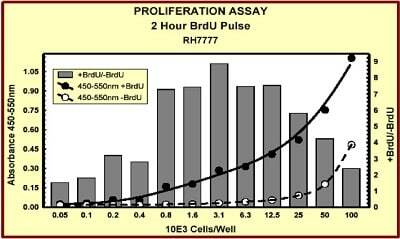 However if it is a high value then it is a good indicator there is a problem with the assay. Q3: Please explain the data showed on the example data included in the protocol. A3: The green bars should be measured with the Y axis on the right. It measures the ratio of wells treated with and without Brdu (+Brdu/-Brdu). The curves with black and white circles should be qantified using the Y axis on the left. The black circles are OD values from wells treated with Brdu and white circles are from corresponding control wells not treated with Brdu. Q4: Why is it suggested to either measure OD450-OD550, OD450-OD595 or OD450 alone when measuring the absorbance in each well? A4: OD550 or OD595 readings act as the reference wavelength. A reference wavelength is used to take into account any variations in the data due to the spec itself. However this reference wavelength value is typically very small so not always used. Can this be used on Pig cells? Yes, ab126556 can be used with pig cells. 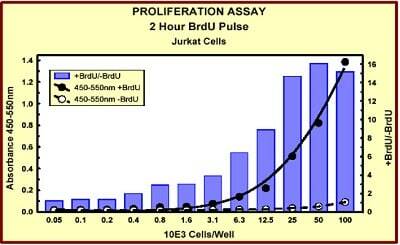 This kit detects incorporation of BrdU independent of the species of the cell line being tested.